It’s the premier sporting occasion on the planet, watched by a global TV audience estimated at over 3.6 billion, and Jacobsen products will play their part as golf returns to the Olympics in Rio de Janeiro next year, after a 112 year absence. 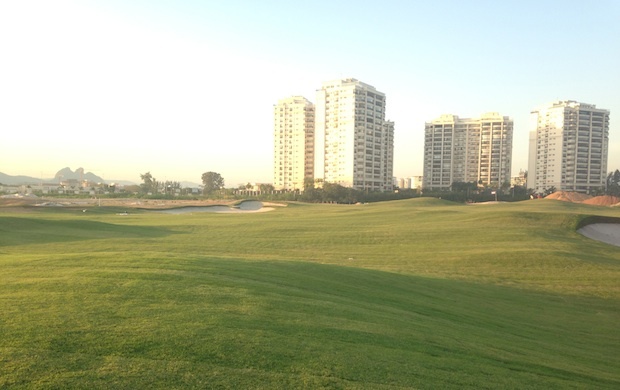 The golf course has been constructed in Barra da Tijuca, a district of Rio de Janeiro that contains the largest number of Olympic Games venues and is located 7 kilometres from the Athlete’s Village. 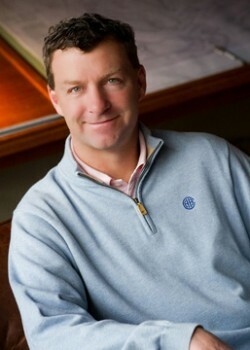 Gil Hanse and his team won the battle to design the course and were awarded the contract following submissions from seven other high profile entries – Gary Player Design, Greg Norman Golf Course Design, Hawtree Ltd, Nicklaus Design, Renaissance Golf Design, Robert Trent Jones II and Thomson Perrett. Hanse was voted ‘Architect of the Year’ by Golf Magazine in 2009, the same year that one of his designs, Castle Stuart in Scotland, won the accolade of ‘Best New International Course’. After a delay due to a customs-related issue with the irrigation system, construction began towards the end of 2013. Based on a typical layout that would be found in Australia’s sand belt around the Melbourne area, the course features natural vegetation, extensive bunkers, a lagoon and sandy rough ground lining the fairways. The mix of grass species is an interesting one with Zeon Zoysia used extensively on tees and fairways, while SeaDwarf Seaside Paspalum is used on the greens. Both species are drought tolerant and the Paspalum is also saltwater tolerant, which is important as the quality of the irrigation water will be variable. None of the grass on the course has been grown ‘in situ’ from seed; all the grass cover has been laid as turf or sprigs. Marcello Matte is the owner of Green Grass Brazil, who is responsible for producing the grass that has been used across the 35 hectare (85 acre) site. The Zeon Zoysia cultivar, explicitly for use on golf courses, has been developed by grass breeder David Douget of Bladerunner Farms in Texas, USA. 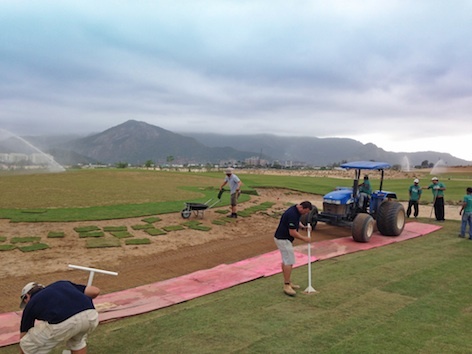 The planting of the golf course began in May 2014, using three different approaches; the majority of the Zeon Zoysia areas – tees and fairways – were planted using large rolls of turf, but some areas were planted using oblong shaped turf sods. The SeaDwarf Seaside Paspalum used on the greens were all planted as sprigs. As well as being drought tolerant, Zeon Zoysia has low fertiliser requirements and grows in a dense mat, which helps with weed suppression. Course Superintendent Neil Cleverly, a member of BIGGA, is the successful Englishman who landed one of the most sought-after jobs in the industry back in June 2013. With a portfolio that encompasses Europe, Asia and the USA, he is extremely experienced in the management of warm season grasses. “I didn’t meet him until after he was selected. He was interviewed at the GCSAA show in San Diego, which I was unable to attend. Jim Wagner from our company went down and was part of the team that interviewed him. By all accounts Neal did a great job, he’s got a ton of experience overseas, primarily with warm season grasses, which was a bonus. “Although he doesn’t have experience with Zeon Zoysia, which is the primary grass on-site, he’s well equipped to deal with it and he has been a Godsend. During the early parts of construction it was basically me and a couple of guys who work with me down there. Working without a project manager and trying to make sense of it all was difficult, and then when Neil showed up he immediately took over as project manager. “One of the deciding factors was that we have a local distributor in Brazil. 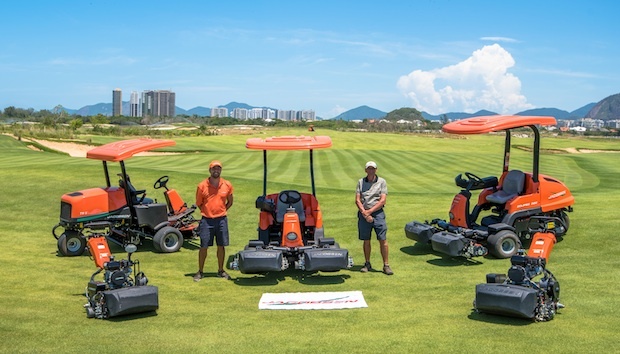 ProGolf has represented the Jacobsen brand in Brazil since 2012 as well as Ryan, Turfco and Smithco; three companies with whom we have excellent working relationships across the globe. 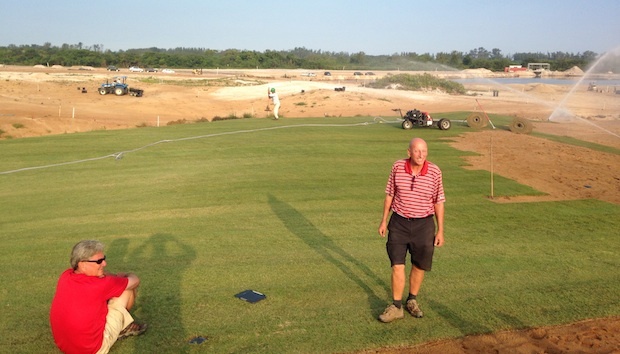 ProGolf’s core business is golf course construction, and they are working as sub-contractors at the Olympic course. “It’s a tremendous accolade to be associated with the Rio Olympic golf course and, once again, we’re delighted to be involved with the Olympic Games as it continues a tradition for our business that goes back over many decades. This was a particularly important win for us, as it marks the return of golf as an Olympic sport after more than a century, and it’s sure to be one of the high-profile events at the Games. 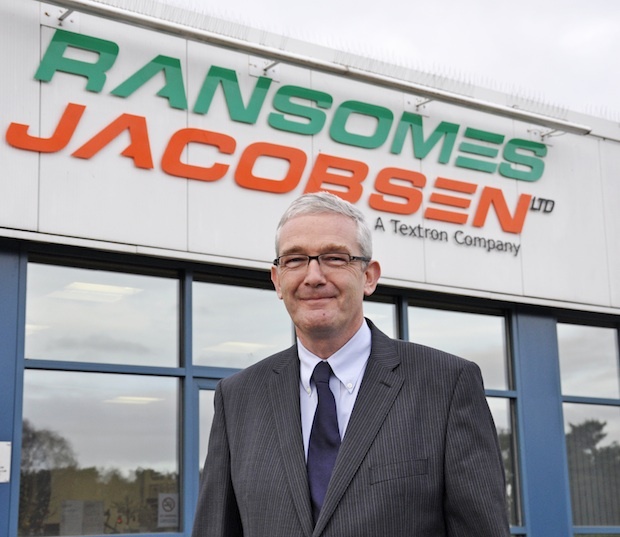 With turfing underway in May 2014, the initial delivery of 18 Jacobsen machines followed a month later. This consisted of three Eclipse2 walking greens mowers, two Eclipse 322 hybrid powered ride-on greens mowers, four Greens King walking mowers, one SLF1880 super light fairway mower, two LF3800 fairway mowers, three Turfcat out-front ride-on rotary mowers, two UK-built TR3 reel mowers for tees and surrounds and a GA30 pedestrian aerator. 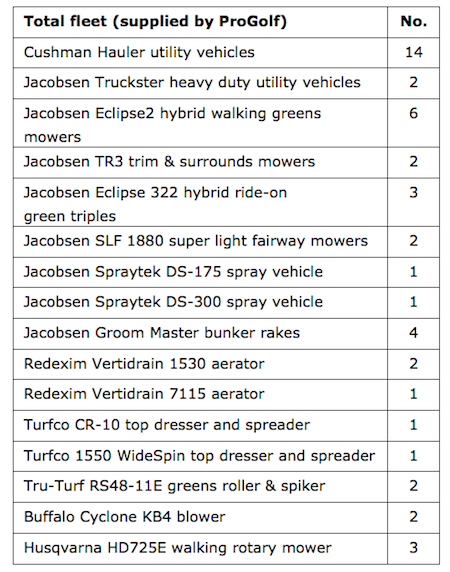 “The Eclipse mowers are an important part of the package,” said Jacobsen’s Frederico Santa-Barbara. “Neil and his team consider them to be the best greens mowers on the market; they are the only mowers with total control over the number of cuts per metre and the reels on the walking versions can be used on the ride-on machine, providing great flexibility. 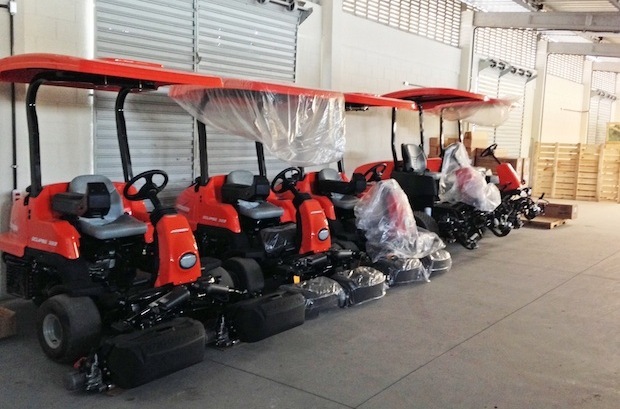 By the time the first test event takes place early next year a total of 35 Jacobsen turf maintenance machines will be employed at the course. In the interim, Jacobsen’s Product Support Manager Andrew Echenique will be providing technical training for Neil Cleverly’s team and he will be part of a team of Jacobsen technicians who will be running the maintenance facility over the course of the event. During the Games, the course will host two 60-competitor tournaments with the women’s event following the men’s competition over a two-week period. It will accommodate 2,500 spectators in grandstands with space for a further 17,500 around the course. Post-Games the course will be the only 18-hole public facility in Rio de Janeiro and Brazil. The Clubhouse will become a multi-purpose venue used for public meetings and social engagements, while the driving range and golf academy will be used for golf practice, instruction and education. Perhaps the most important legacy will be the implementation of a youth development programme dedicated to providing young people of all backgrounds opportunities to continue their education and develop their character through golf. Funding from the Brazilian Olympic Committee to the Confederation of Brazilian Golf will be used for junior golf initiatives around Brazil. egraded land will be restored by the creation of green space with local access. The venue will be certified as environmentally sustainable by creating a watershed and providing attenuation, natural filtering and water treatment. The biodiversity of the area will be enhanced by managing the water run-off, thereby conserving the soil structure and restricting erosion. Improvements in the ecosystem will increase native plants and encouraging the local wildlife. Finally, the return of golf has the potential for increased awareness and interest in the sport, not only in Brazil, but across the globe; increased accessibility to play due to the public nature of the 18-hole course and, eventually, increased participation in golf. To view more images of Jacobsen’s involvement in the Rio Olympics re-intriduction of Golf, head to turfmate’s facebook page.